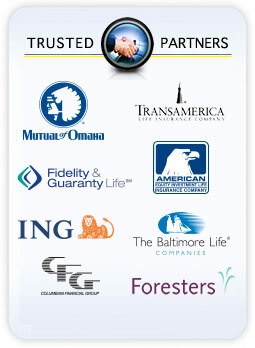 Term life insurance pays your family a cash benefit in the event of your death. This protects your family from financial burden and allows them the proper time to grieve without worrying about how they will make the next mortgage payment or any other financial situation. Death is one of the worst emotional hardships a family can go through and all too often we are not prepared. This coverage gives you the protection you and your family need to be prepared. Whether you are starting a family, buying a home, getting married or any other life event, they all come with new financial responsibilities. Term life insurance protects your family if you died tomorrow. Just ask yourself a few questions. Could your family pay the bills? Could they afford funeral costs that on average cost $10,000? Without your financial support how would they get by? Although these questions are very difficult to deal with, they are things we have to deal with. If you don't have a solution to any of the above problems, term life insurance is something you really need to consider. Family Protection Center offers plans to meet your budget needs and one of our specialized agents will create a plan to make sure your family is protected from life's unfortunate events. You can obtain a free quote by filling out the form to your right and one of our life insurance specialists will develop a plan that meets your coverage needs.